Family practices offer powerful benefits for advisors and clients when the dynamics are handled right. 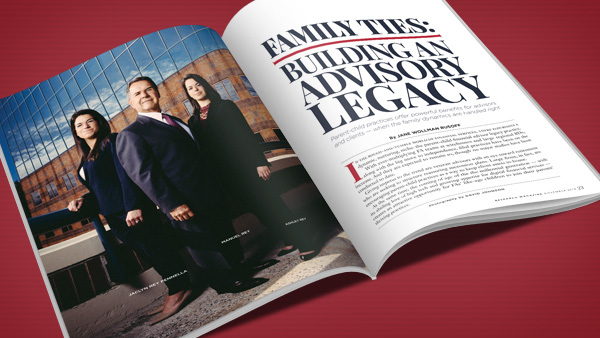 In the rough-and-tumble world of financial services, there flourishes a dynamic, nurturing niche: the parent-child financial advisor legacy practice. With ever-multiplying FA teams at wirehouses and large regional BDs, along with the big move to independence, filial practices have been on the increase. And they are expected to remain so, though no major studies have been conducted to date. Giving impetus to the trend are veteran advisors with an eye toward retirement who are seeking to structure reassuring succession plans. Large firms, in fact, are encouraging parent-child practices as a way to keep client assets in-house. At the same time, the coming of age of the the millennial generation — with its abiding love of high tech and growing appetite for digital financial services — creates an attractive opportunity for FAs’ like-age children to join their parents’ thriving practices. “Many advisors, particularly successful ones, are keen to acquire younger clients. So having a child come into their practice who will focus on acquiring same-generation clients helps. Because [FAs’ children] are also more tech-savvy, they can help their parents grow online services, which more and more advisors recognize is key to attracting and acquiring the next generation,” says Sophie Schmitt, senior analyst, wealth management team, with Aite Group in Boston. Only 21% of a financial advisor’s client base is age 40 or younger, according to an Aite study in 2014. On-boarding FA trainees in their 20s or 30s brings fresh perspective and modern approaches to practices where senior FAs cling to “old-school” ways. Further, a legacy practice serves as a competitive advantage by reassuring clients and prospects that a next-gen advisor will be there once the parent advisor exits. Of course, to make such practices work, it’s essential that parent and child enjoy a mutually respectful relationship and get along unusually well. In San Francisco, Abu Farukh, 65, senior vice president-investments at Golden Gate Wealth Management of Raymond James, brought daughter Misty Farukh into his business eight years ago, when he was with Smith Barney. Now, Misty, 30 and an associate vice president-investments, does most of the practice’s financial planning. Overall, she has promoted and facilitated one-stop shopping for clients’ financial needs. In union there is strength. The same goes for unions of parent-child FAs. “Alex is helping me take care of our clients better than I could on my own,” says Jerry Goss, 66, C.E.O. of Goss Wealth Management, whose son, 32, joined his practice in 2009. Many children are partners compensated by a revenue split; others are salaried employees and earn bonuses. In most instances, a single book of business is serviced by the parent and child together. To be sure, next-gen FAs are taking their parents’ practices to a higher level by introducing new and different ways of operating. For instance, young advisors often put more stress on efficiencies, preferring to rely on systems, processes and flow charts. Free of digital angst, they routinely employ electronic technology to accomplish tasks for which their parents used pencil and paper for many a decade. Conveying to his two daughters all the client information he had kept in his head for more than 30 years was something of an ordeal for Manuel Rey, 64, managing director of Rey Financial Group of Wells Fargo Advisors. Jaclyn, 30, joined Dad nine years ago; Ashley, 28, followed four years later. Both women are now associate vice presidents-investments. The three advisors, based in Short Hills, New Jersey, manage client assets of about $190 million; accounts average $2 million to $5 million. Open communication within the team is key to making the Rey practice work. Indeed, that togetherness manifests in one 20-by-30-foot office, which holds their three desks and a conference table. Trust is of course paramount. But perhaps the biggest impediment to a successful parent-child partnership is the senior advisor’s reluctance to relinquish control, while the child is impatient to make changes. Therein lies a power struggle. Patience and persistence helped the Rey sisters convince their father to make changes. “If you want to keep growing and get where you want to be in the future, you can’t do what you did 30 years ago,” Jaclyn Rey Pennella told Dad. In the bible of FA parent-child do’s and don’ts, the first, and perhaps most important, commandment is: At the outset, clearly delineate in writing your daughter or son’s role, responsibilities and compensation, including how that could shift as the practice evolves. At the Roberts/Hutto Group at Merrill Lynch, in Sun City, a suburban Phoenix retirement community, Ed Roberts’ role was hazy when he joined his parents’ practice in 2000. Brother Craig, four years Ed’s senior, already had been working there for nine years. But with no specific plan, Ed got off to a rocky start; and in 2004, three years after Craig became lead advisor, he left. Three years later Ed returned but not without making sure his role was carved out and specific. “The first time was difficult because I was the younger brother and outsider. I wanted to have more say in the business,” says Ed, now 48. Dividing duties based on each team member’s strengths is the best approach. In the Roberts’ practice — with AUM totaling $170 million — Ed, now COO, handles financial planning; Craig, CEO, is deep into “Xs, Os, alphas and betas,” as Ed puts it. At the Reys’, Ashley does most of the asset allocations, client reviews and research, while detailed-oriented Jaclyn deals with insurance, 529 lending and the like. The two handle 90% of the portfolio construction, Manuel says. Treating one another as professionals at work, rather than in a family manner, is a trick that requires compartmentalization. “If there’s an issue with the family, we’re able to shut that down and move into business mode when we hit the office,” says Alex Goss, who joined his dad when the elder Goss was employed at Wells Fargo Advisors. Last fall, with $520 million in assets under management, the Gosses and two other advisors went independent with LPL Financial as their BD. Jerry is based in his firm’s Baton Rouge, Louisiana, office; Alex, president, is in New Orleans. The two meet up every week. Though senior FAs are often resistant to using advanced tech and stepping into social media, their FA children, taking the lead, are showing them the value of digital. “I told my dad that to grow the way he wants to, we had to be a little more efficient in certain respects [such as tech]. Now he sees what using technology has done for our business,” Misty Farukh says. Certainly, in order to grow, it’s always necessary to step out of one’s comfort zone. So “invite the younger person to challenge you a little in your views and ideas,” recommends John Weibler, 60, whose son Matt, 30, came to Weibler Financial & Retirement, in Lewiston, Idaho, fresh out of college. The two manage $70 million in client assets. Matt has been influential in encouraging Dad to take on clients only if the fit is ideal. “Sometimes, when new business sounds good but isn’t perfect, my father forgets that he doesn’t need to take on that client unless it’s someone he cares for,” says Matt, whose CFP designation — John is without one — recently helped net two new clients. Patience and understanding on the part of both generations is essential. Mary Ann Blair, 71, and daughter Emily Woodson, 41, partners in The Financial House, in Centreville, Delaware, whose BD is Lincoln Financial Securities, have deep empathy for each other. That promotes compatibility and helps them cut some slack when appropriate. “People who have worked very hard to build up a business, as my mother has, aren’t used to sharing responsibilities. This can come across as controlling. Mom has been good about that, though a few times I’ve had to assert myself,” says Woodson, a former schoolteacher. Blair is delighted that Emily employs her teaching skills to educate clients about investing. But at the start, all that was new to her daughter too. “I strived to be patient and remember that there’s a certain language in this business that takes time to get used to,” Blair notes. In view of this, young advisors would be smart to participate in client meetings from day one, senior FAs recommend. One great Rey rule: Don’t correct or disagree with one another during a client meeting. Wait until later. No matter how competent the progeny, disagreements between parent and child often crop up. That’s when a “cooling off” period comes in handy and the issue revisited tomorrow. To get perspective, John Weibler occasionally seeks the opinions of other FAs or those of his BD, Commonwealth Financial Network. “What I’m looking for is: Should I stand my ground [in disputes with Matt] or am I wrong?” Weibler explains. Though some advisors insist they’ll never retire (“You’ll probably find me gone, sitting in my chair!” Abu Farukh cracks), they do plan to cut back; and they have, sensibly, structured formal succession plans, if only for emergency use. In contrast, Ann and Dave Roberts had a step-by-step plan in place to retire and leave the practice to their two sons. Four years prior, they turned the business over to Craig to run. Originally, Merrill Lynch wasn’t receptive to the Roberts’ plan for a family legacy team. Of course, a legacy practice is doomed if the sole reason a child joins is for shelter from the storm, labor market-wise. “Think: If this weren’t your child, would you bring them in?” counsels Jerry Goss. Finally, one big don’t: Don’t forget to laud your issue for a job well done.